Coworking Night has been an excellent opportunity for me to collaborate with other local developers on a variety of projects. It has also been a place to share big ideas and challenges through stimulating conversation during meetings like the book club. I always look forward to co-working night. There is always someone there who seems genuinely happy to see you. Coworking Night is a movement, every bit as much as an event. It provides a sense of community that I personally was in desperate need of. Coworking Night has provided our writers with a critical resource: a beautiful space to get stuff done in authorial fellowship. Attendees will remain kind, courteous, and respectful of all other attendees. Attendees will respect the wishes of Huntsville West's building manager and will not disturb any furniture, electronics, or items that are not authorized for CoWorking Night use, including food and drink. Attendees will not disturb or interrupt Huntsville West employees or it's members while they are working. Attendees may not use or disrupt materials on Huntsville West employee work stations or the work stations of it's members. Employee/Member wastebaskets may not be used to dispose food or drink. We believe CoWorking Night is important for growing and connecting the Huntsville area. It takes a great deal of work and resources to make it happen each week. If you'd like to help CoWorking Night continue success, you can contribute to our sponsoring non-profit organization, Urban Engine. Thank you! CoWorking Night is presented by Urban Engine. 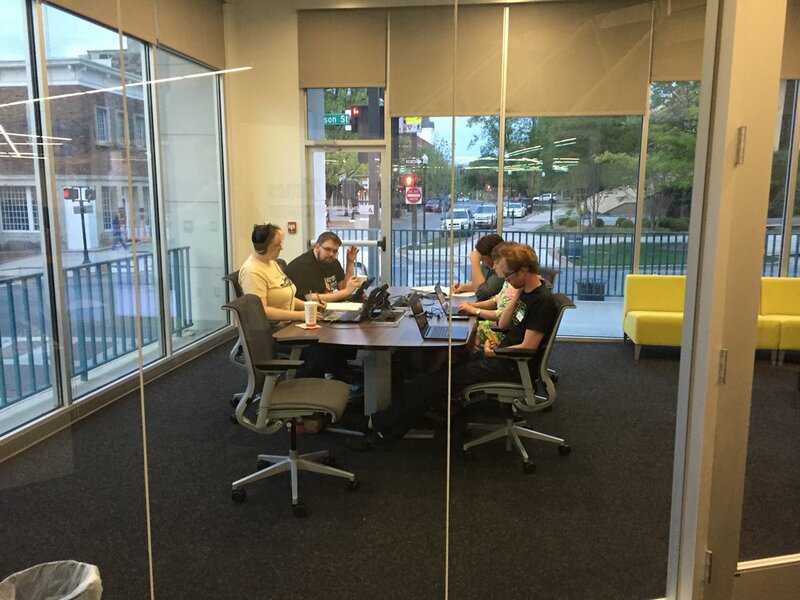 CoWorking Night was founded in April of 2015 when Chris Beaman and Larry Mason launched Code for Huntsville inside Alabama Media Group's downtown hub. Code for Huntsville's kickoff meeting drew a crowd of technologists and entrepreneurs who were eager to participate in regularly-occurring "hack nights." As such, Hack Night was born. After a few months, Hack Night's momentum began to wane. Fearing stagnation, Chris turned the reins over to Noah Huber-Feely, who had recently begun attending the group. Noah's perseverance led Chris and the team from OpenHSV to reinvest in the group and try some new strategies for engaging attendees. Among those strategies was a rebrand to "CoWorking Night" (in an attempt to engage collaborators from all professional disciplines) as well as bringing in outside speakers to headline talks about their professional experiences. These strategies worked, and attendance began to grow. In October of 2015, CoWorking Night debuted its first weekly recurring sub-group, Write Your Masterpiece. Organized by Alex White, a local novelist, Write Your Masterpiece was a community of folks who met at CoWorking Night to write together. Over the next six months, CoWorking Night would see a rise in the number of sub-groups that met weekly or bi-weekly. In June of 2016, Chris Beaman recruited a leadership team of dedicated volunteers to fulfill specific roles in helping to facilitate CoWorking Night. As of this writing, CoWorking Night's leadership team has grown to nine members and is present at nearly every event. In January of 2017, the event moved to a new location at Real Estate Row. As of October 18, CoWorking Night is held at Huntsville West, a venue that better accommodates it's growing number of workshops and members. Today, CoWorking Night identifies as an events platform for professional workshops and groups. More than 80 CoWorking Nights have been organized, for which the team remains incredibly grateful. Additionally, there are now 24 different groups that organize at CoWorking Night, each covering a separate topic or professional discipline. The CoWorking Night team continues to strive toward better program facilitation, clearer communication with members, and more opportunities to help members learn, connect, and collaborate.